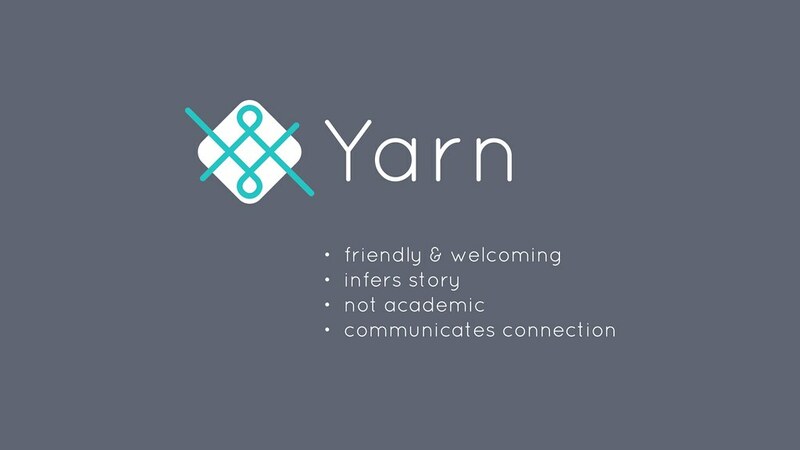 We launched Yarn at the "Connecting Communities" in Leeds on 27th March. 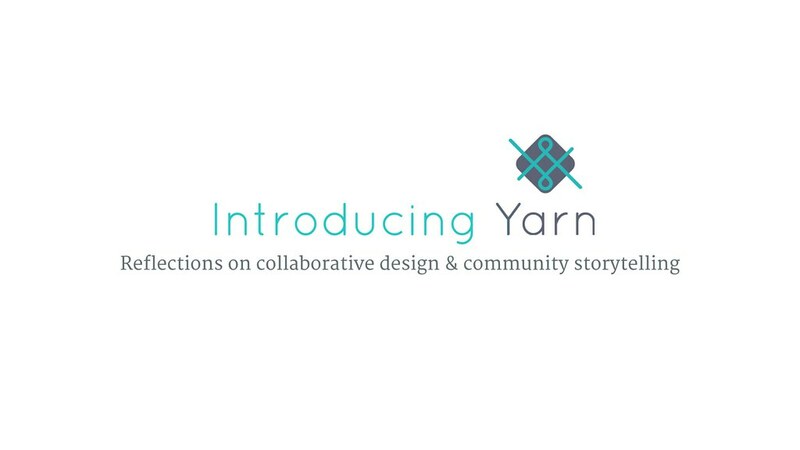 To close the first day of the conference, I gave a talk to introduce the story of Yarn and the journey we'd taken in designing it. Hey everyone, my name is Imran Ali. 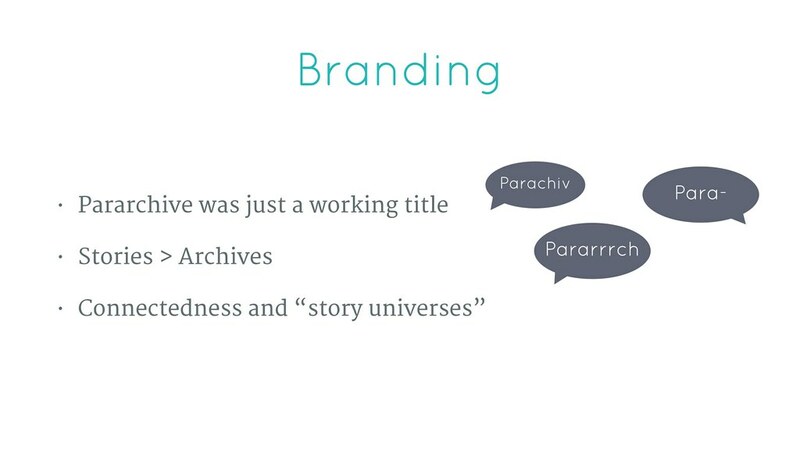 For the next ten minutes or so, I thought I’d reflect on the design and technology approach to the Pararchive project and share some of the insights we’ve gained over the previous 18 months research, before we give everyone a quick demo of Yarn. 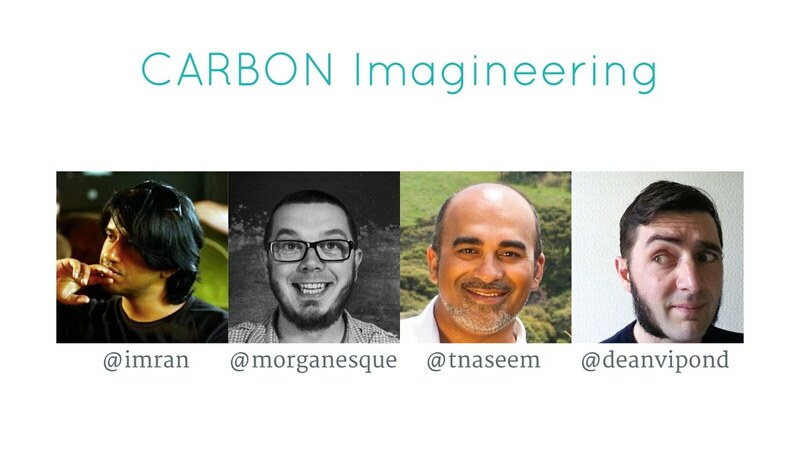 I’m one of the founders of Carbon Imagineering, a digital innovation and R&D practice. Much of our work is about exploring the implications of emerging technologies and how new opportunities can be crafted from disruptive innovation. The team we assembled for this project includes myself as producer, Tom Morgan on interaction design and front-end development; Tarique Naseem as our lead on software engineering and Dean Vipond on interaction design and brand development. Back in Autumn 2012, Simon was introduced to us as part of matchmaking programme that brought together academics and creative technologists to explore new areas of research. Over the course of four caffeine and cake fuelled afternoons, we deliberated and ideated on storytelling, memory, institutional archives, journalism, personal collections and where technology was enabling and disrupting all these things. 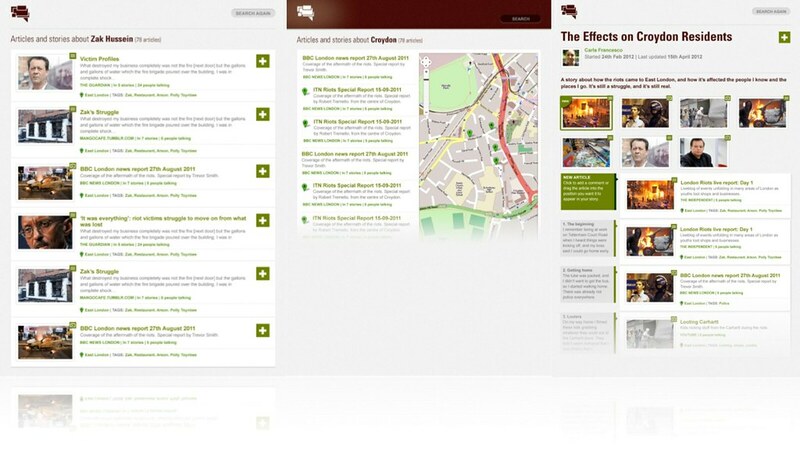 From these conversations we created a concept called Pararchive, an app for exploring stories about the London riots in 2011. 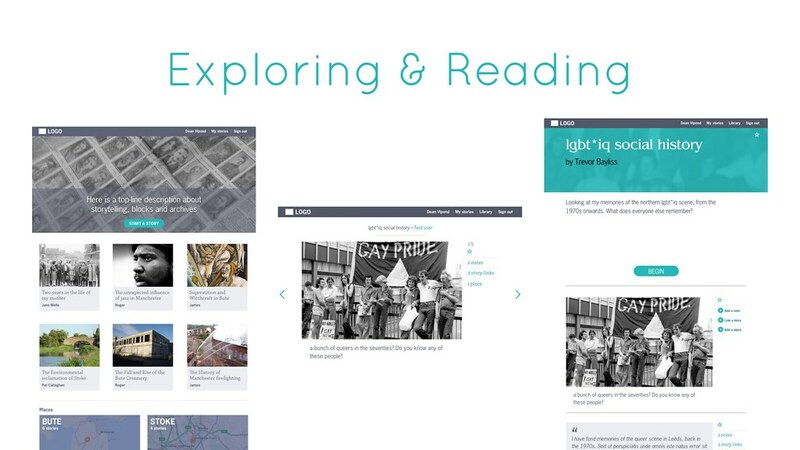 We wanted to bring together social media, open data, personal perspectives and large institutional archives and collections into a new digital public space. More importantly than a concept design, it surfaced a few key principles that we hoped would guide a larger research project. 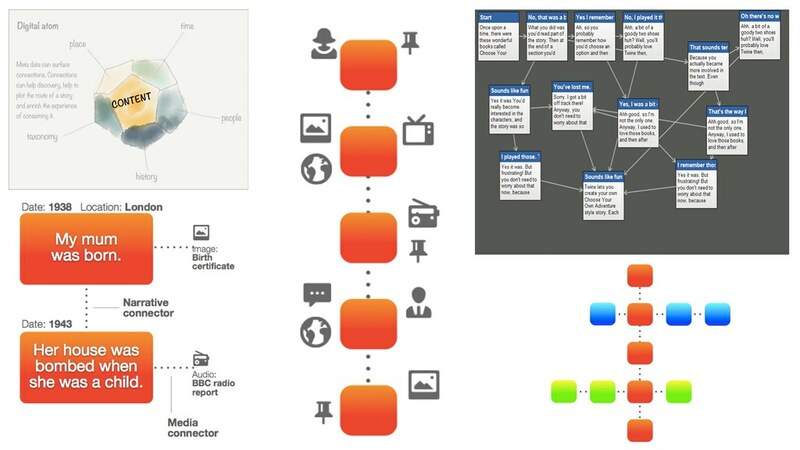 Our digital public space, focussed on narrative rather than truth, it orchestrated pieces of media from various places on the web, respected sources and we hoped would lead to an emerging fabric of connected stories. By this point, we’d been using fictional personas and archetypal users, it had became time to begin working with real people and real stories. 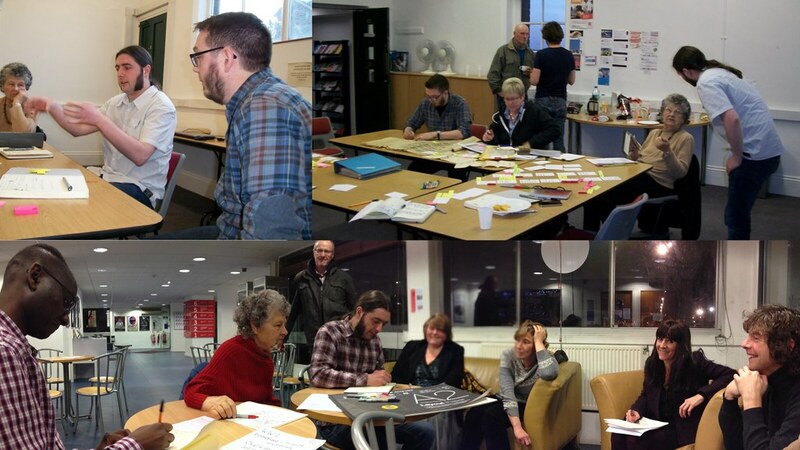 Hosting an ongoing series of small co-design workshops it became quickly apparent that we had access to remarkably committed and passionate group of people with astonishing stories, stretching across communities in Scotland, the North and the Midlands. We’d come from backgrounds where we were used to designing for millions, so it was quite a privilege to be able to design for dozens . This meant care, empathy and respect became as crucial as our design approaches. As we developed friendships with those we worked with, an acute sense of responsibility became central to our work. 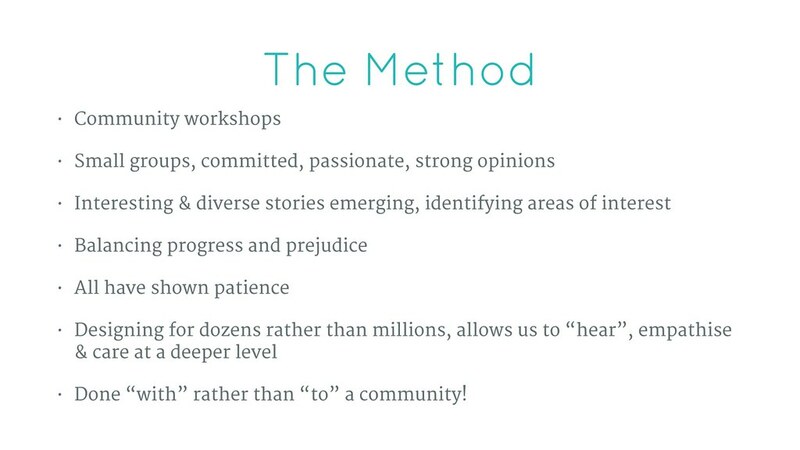 But we did have to balance our needs to move workshops forward without prejudicing them with our own tastes and biases. 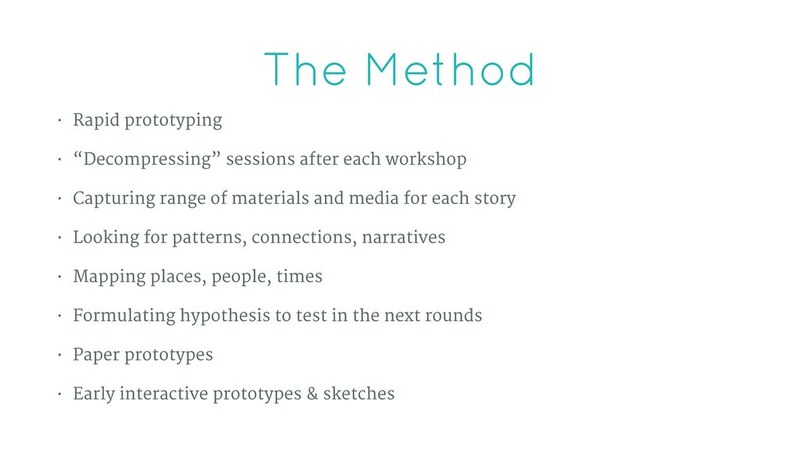 After each workshop we’d take time to decompress and reflect on findings, capturing as much material as we could, looking for patterns and connections, mapping places, peoples and times to formulate ideas that we’d test in the next round of discussions. This involved a lot of mind-bending Post-it note physics! You may be interested to know the adhesive isn’t compatible with Tom’s dining table. Around Spring 2014, we began to reflect on what the smallest unit of a story could be, essentially it’s atoms or DNA. How would they be created, discovered, connected and shared. 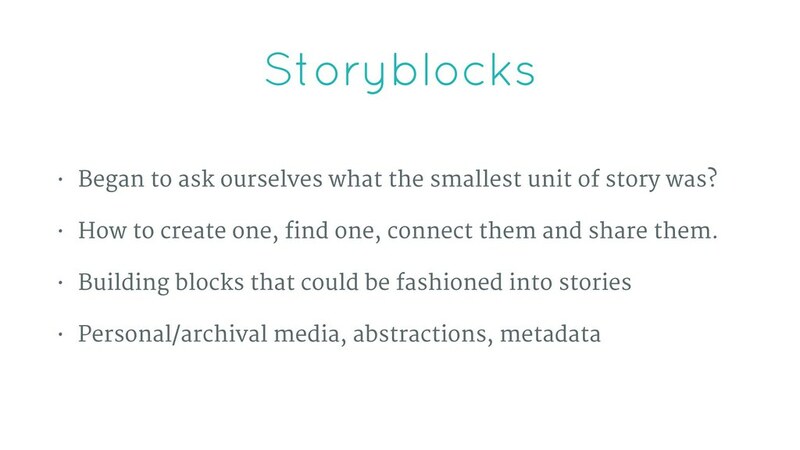 We started to think about story “blocks” of personal or archival media, abstractions like places and people, and what kind of tools might be needed to orchestrate them into stories. 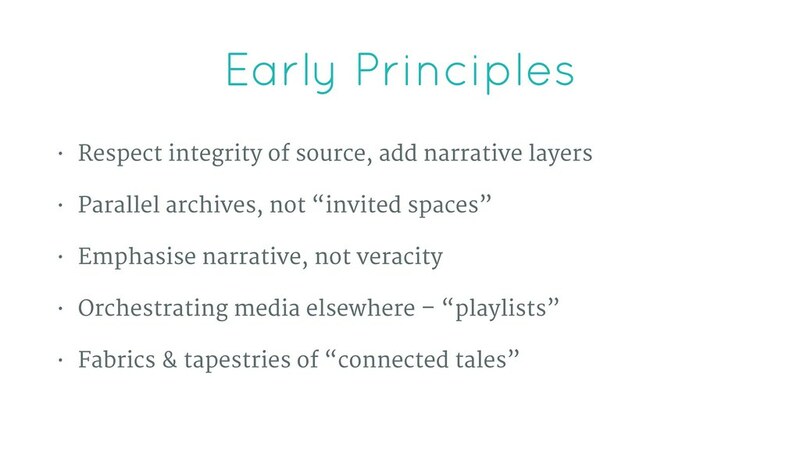 We arrived at the notion of a block being almost a “passage” to which metadata and media could be attached from archives, the open web and personal collections, enabling rich connections to form amongst otherwise unconnected stories. The kind of tapestries we always imagined. Our communities in Bute and Stoke embraced this – actually they’d co-invented it! 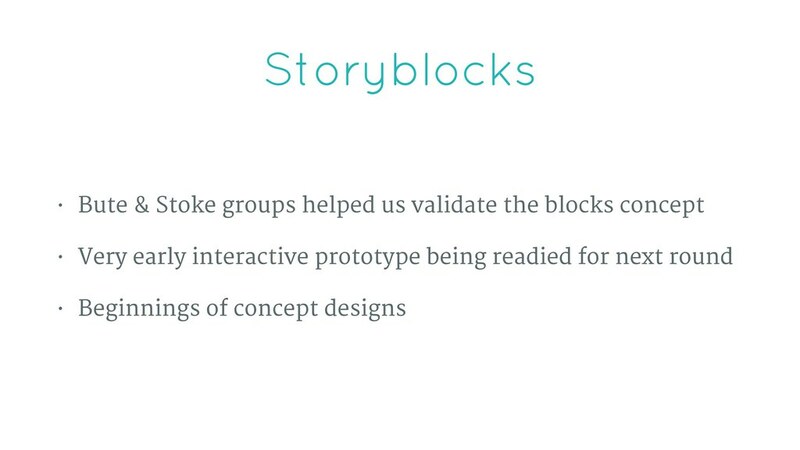 We quickly moved from using paper models to creating an early digital prototype to see if their stories could inhabit a series of these storyblocks and honour their original narratives. 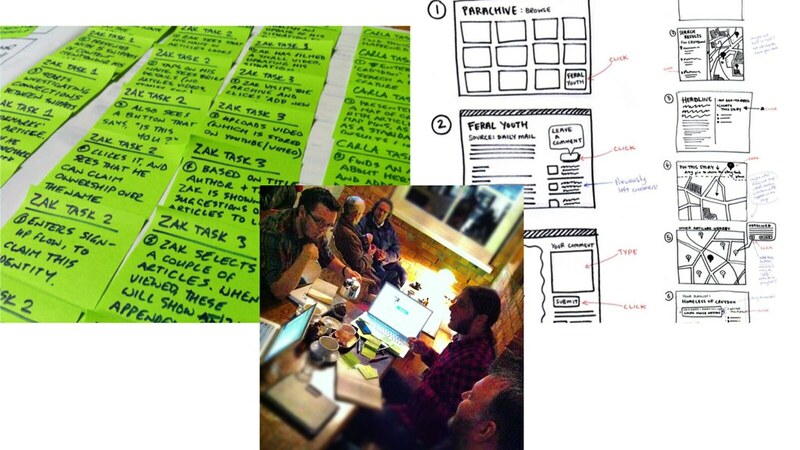 That first prototype, allowed us to move forward on designing detailed storyboards and begin to think about more intuitive flows and interactions between features. 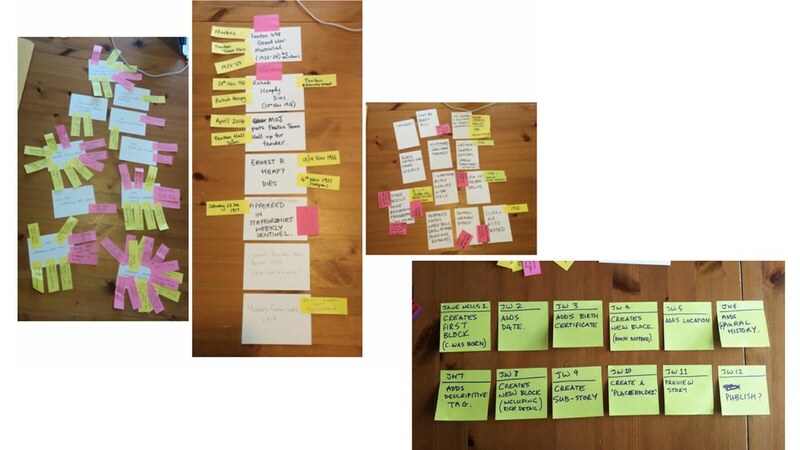 We were now at a stage where we could structure findings from the prototype into a cohesive app and a glossary of features. We could also move beyond the storytelling features we’d prototyped and start to consider how themed catalogues and master collections might be represented for our archive partners such as the Science Museum. 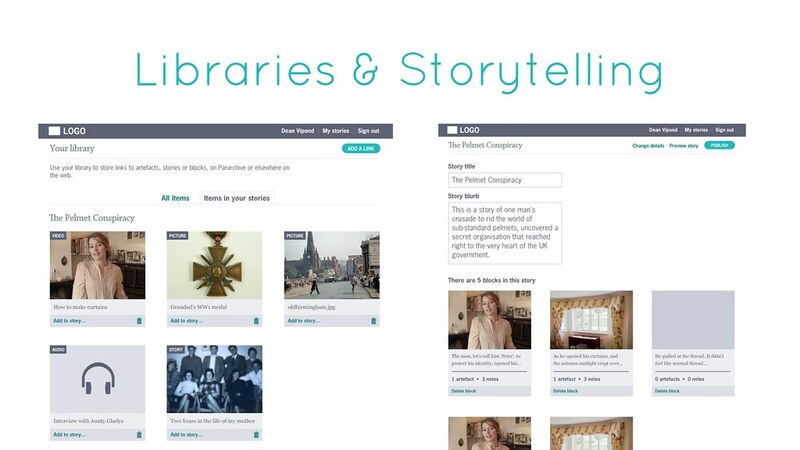 Firstly, the reading experience - how would people discover and consume stories, what would they look like. 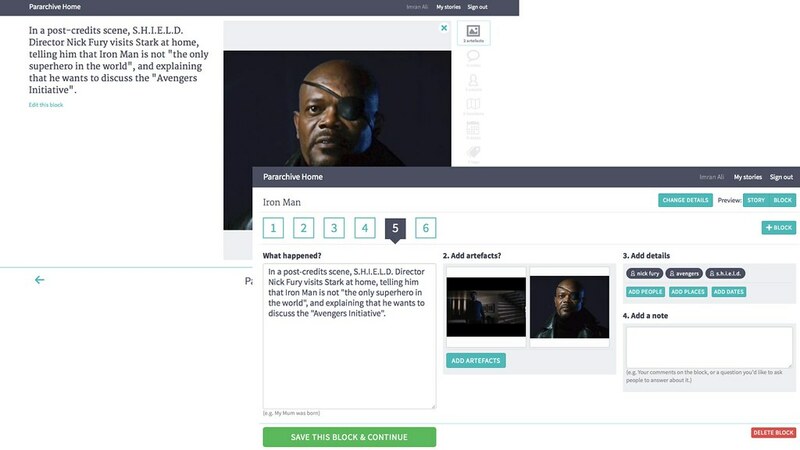 Secondly, how would our users collect and orchestrate material and create their stories, joining small pieces of the web loosely into a cohesive narrative. 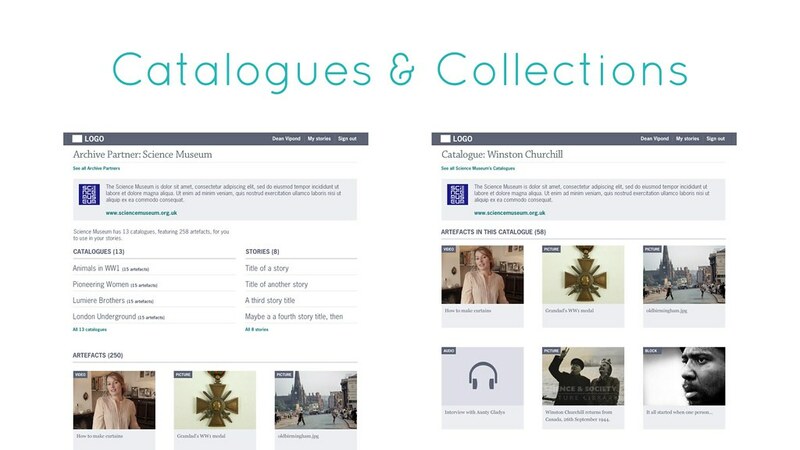 Lastly, how would our archive partners’s collections and catalogues be created, presented and maintained. 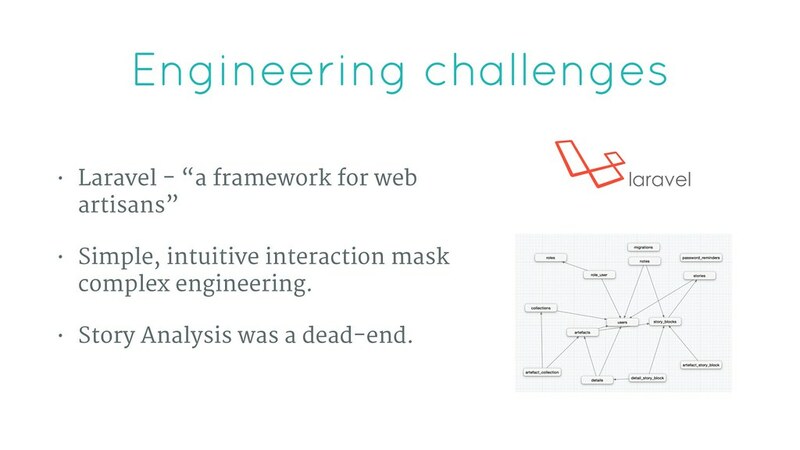 As we moved from the prototype to developing a richer beta, we also faced a number of engineering challenges. Firstly used an unfamiliar software framework, which we knew would give us great flexibility and agility in future, but were learning from scratch. 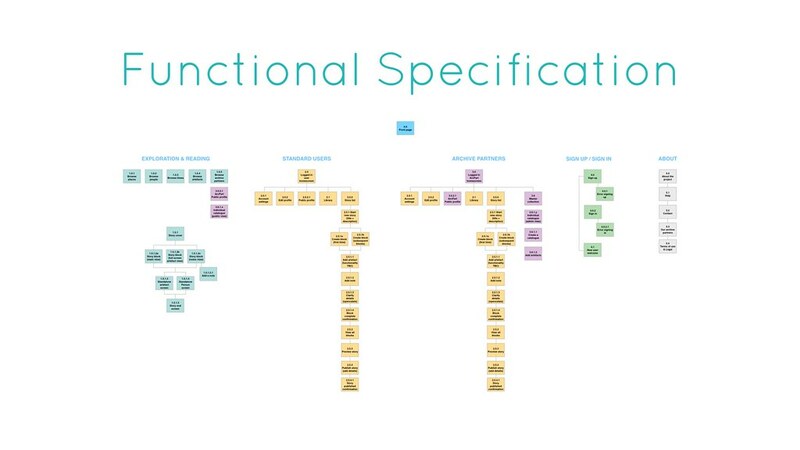 Also, though the design was elegant and simple, this required a complex database and logic core, anticipating all kinds of unexpected user behaviour. Lastly, we attempted to build story analysis tools, extracting names, places and times automatically from stories, but results were too inconsistent to make for a reliable feature. Unlike most commercial projects, we had the space to explore such possibilities. Our last significant area of work was to develop a brand that reflected the journeys taken by everyone involved in the project. Archives were just one part of the stories our users were attempting to tell. We also needed to provide a voice for myths, tales and rumours as much as historical and archeological research. We needed a brand that conveyed storytelling, but not veracity. And one that underlined the power that connectedness could bring across a universe of many entangled stories. Like many of ideas during this project, we’re not sure who coined it, but Pararchive became Yarn – a brand that seemed to embody all our hopes and insights. It honoured the contributions of everyone involved and conveyed the very human values at the core of the project, as well as returning us to one of our original principles – that of fabrics and tapestries of connected tales. Fundamentally, our Yarns aren’t simply ON the web, but OF the web, weaved from the fabrics that are already out there. So with that thought, I’ll introduce Dean and Tom, who’ll walk us through the public beta of Yarn. We’re still polishing but it is available for you all to play with today, though the final release is pencilled in for the beginning of May.